The US federal government is shut down and certain economic data accounts are being left to go without scheduled updates, things like US trade provided by the Census Bureau. The Bureau of Labor Statistics’ more watched series aren’t among the forgotten, however. The monthly payroll report would be compiled and released even during a nuclear attack. Yes, it really is WWWIII but did you see the blowout jobs figures! I have no doubt that Jay Powell wishes consumer inflation was being treated like Ex/Im rather than employment numbers. We don’t know how much the US imported or exported in November, but we do what the consumer price index did in December. It wasn’t good for him. The headline monthly inflation number wasn’t any surprise. It was muted, as some might say. The truth of the matter is what we’ve been saying all along. The only factor driving consumer price inflation, according the calculations of these various indices, has been oil prices. Live by WTI, die by WTI even though there is no WTI in the consumer basket. Working backward, we begin with the overall inflation for December 2018: +1.91% year-over-year, down from 2.18% in November and 2.52% in October (when Atlanta Fed President Bostic was flipping out of his mind). 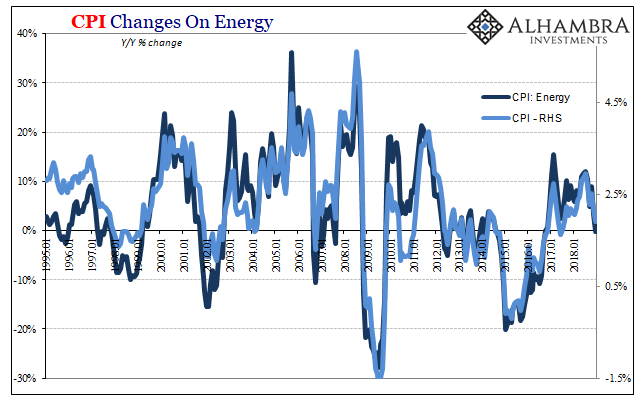 The energy component contracted by a small 0.2% but it was the first minus sign for this important contributor since September 2016. 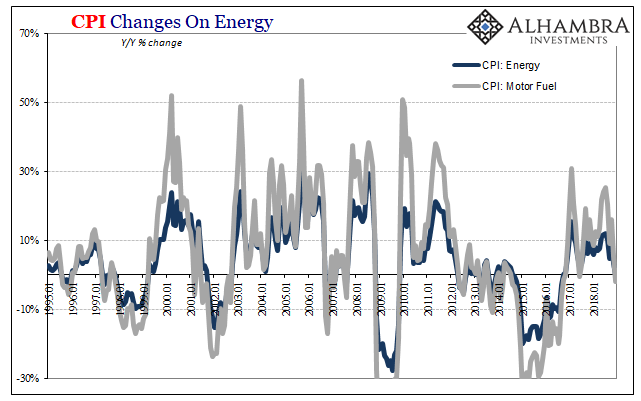 The piece that most moves CPI Energy is gasoline prices, or the subcomponent for motor fuel. This part of the index declined 1.9% year-over-year, the largest decline also since September 2016. And gasoline prices follow WTI. As a monthly average, the domestic crude oil benchmark in December was down 14% year-over-year, setting the inflationary tone for everything that follows from it. The end result overall is stunned and confused policymakers who were certain Verizon was the problem. It’s important to remember the scale of absurdity that is so often deployed as an attempt to explain constantly getting it wrong. 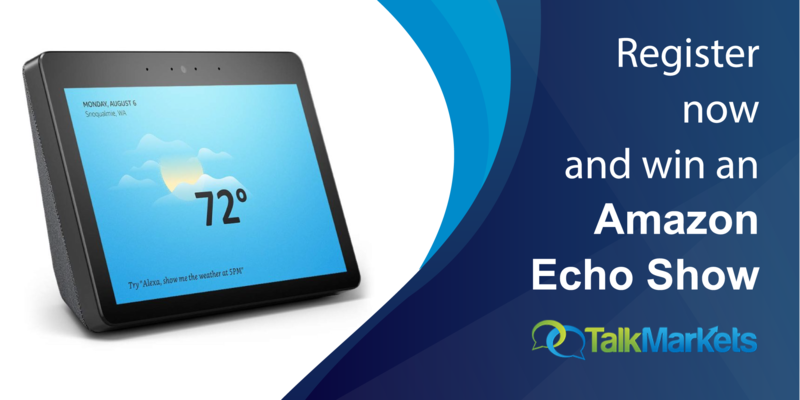 The way in which it is supposed to go sounds entirely reasonable and intuitive. 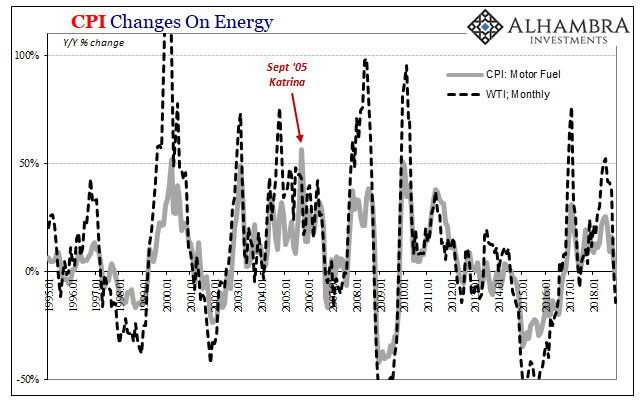 One more time: labor shortage >>> competition for workers >>> sharply higher wages >>> increased costs businesses will pass along to consumers because they can >>> CPI up with or without WTI.